Max Liebermann and Adrian Stokes, “Degas,” The Artist: An Illustrated Monthly Record of Arts, Crafts and Industries, vol. 28 (August 1900): 118. 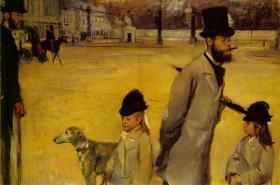 Cited in Walter Sickert, “Degas,” The Burlington Magazine for Conoisseurs, vol. 31, no. 176 (November 1917): 191. Norma Broude, “Degas’s Misogyny,” The Art Bulletin, vol. 59, no. 1 (March 1977): 97, 102, 104, 107.